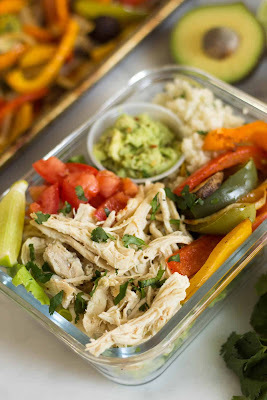 Meal Prep Paleo Chicken Burrito Bowls make for a fresh, inexpensive, and healthy dish for an easy meal or meal prep. Makes 5 servings, ready in under an hour, and Whole30 approved! If you are looking for some more fun ways to use shredded chicken, check out Prep & Recycle – a free meal prep guide to making shredded chicken + 5 different recipes in under 2 hours! Make the fajita veggies. Preheat oven to 375 degrees Fahrenheit and line 2 baking sheets with parchment paper. Add sliced peppers, onion, and mushrooms in a large bowl. Add 1 1/2 tablespoons avocado oil and taco seasoning and mix until veggies are coated. Spread out on baking sheet and bake for 30-35 minutes until soft. While veggies bake, make cauliflower rice. In a large nonstick pan over medium heat, add 1 tablespoon avocado oil and let it get hot, about 30 seconds. Add rice and garlic powder and cook for 7-10 minutes until soft and cooked through. Stir in 1 tablespoon lime juice and chopped cilantro. Assemble bowls. Divided lettuce, diced tomatoes, fajita veggies, and cauliflower rice between 5 meal prep containers. Top with 3/4 cup shredded chicken. Serve with guacamole, cilantro, and a lime wedge. Can keep in the fridge for up to a week. *guacamole might brown after a few days. You can skip this step and add freshly sliced avocado before eating if you prefer. **if you want to heat up the chicken, veggies, and rice, keep those separate. Heat them up and then add over lettuce. 0 Response to "MEAL PREP PALEO CHICKEN BURRITO BOWLS"